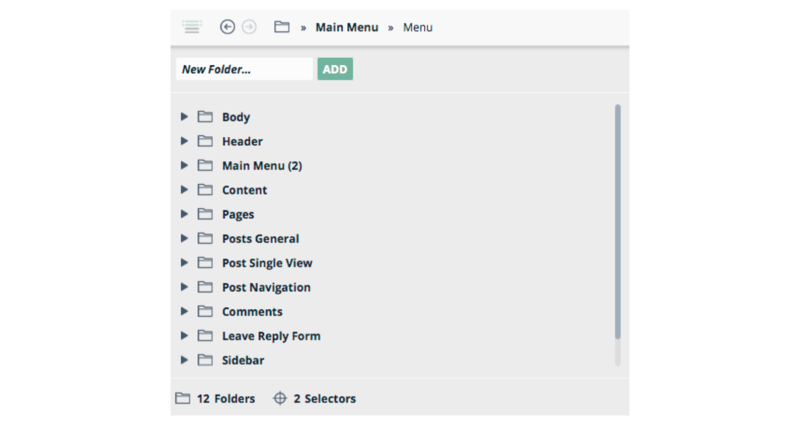 The selector navigation section allows you to navigate between and manage the folders and selectors you’ve created or imported from a design pack. Selectors are organised into different folders (formerly referred to as sections). The backward and forward arrows enable you to quickly move between adjacent selectors. If you click the folder icon, the main menu will drop down. 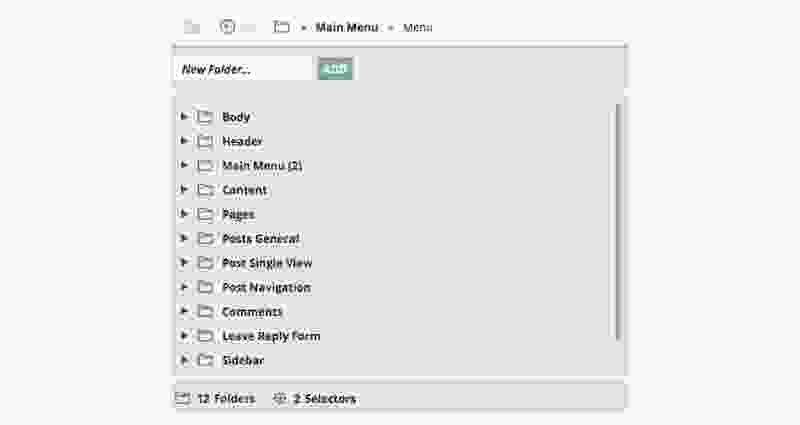 Microthemer comes with 11 pre-set empty folders in which you can save your selectors. From the main menu you can add a new folder. Or if you hover over an existing folder you can rename, duplicate, delete, or manually add a selector to it. To reorder the folders, simply hover your mouse over the folder’s icon and drag it to a new position. If you expand a folder by clicking on it’s name you can navigate between and manage the selectors contained within that folder. You have many of the same editing options for selectors that you have for folders e.g. duplicate, delete, and edit . In addition to renaming a selector, the selector editing options allow you to adjust the CSS selector code used to target elements on the page. And if you haven’t enabled CSS3 PIE globally (which is the default for Microthemer 3.0), you can toggle PIE on or off on a per-selector basis. If you click the name of the current folder in the top toolbar, which will be marked in bold (e.g. » My Folder » My Selector), Microthemer will open a selector navigation/management menu that only displays selectors in the current folder. This can be quicker than always relying on the main menu. If you click the name of the current selector in the top toolbar, you can make quick modifications to the current selector.